Skerat's Synthtronica news: Are you following me and do you follow others? Are you following me and do you follow others? Hello world and welcome to week eight of my weekly blog. Those of you who read my blog last week, will know that I mentioned how hard it is to consistently write something engaging each week. Of course the idea is to draw in an audience and in turn a following. However even if your writing is engaging and people enjoy reading what you say, it still will be a massive challenge to get a person to follow you. There is no obligation to follow my blog and I certainly don't expect someone to have to follow, that would be wrong on my part. However if someone does it's greatly appreciated as it makes me feel like my work is appreciated and that in turn drives me to keep going. Add to this some feedback, like comments and that inspires me even more. Of course this goes for anyone doing a show and to me if you truly like what someone's doing, give a thought to clicking that follow button. This equally goes for internet radio shows and podcasts and their spinoff social media pages, like Facebook, Twitter, etc. If you love any of these shows, perhaps look into their associated pages. You will not only be supporting the DJ, but you will be actually engaging with a great community of like minded people. In turn you will also be bolstering support for not only the DJ, but more importantly the artists as well. Of course you have to be incredibly selective with your choices, as there is a hell of a lot of shows and pages out there. Still of those ones that you really do like, they certainly can do with your support. All it takes is just a simple click on a follow or a like, believe me it does make a significant difference. Now equally this applies to me, I try to follow and like as much as I possibly can from the scene. Therefore if you have music that fits with my show, I'm very interested in following you and I will certainly try to follow you back when you follow me. The only problem for me though is that it might take some time, so please don't be disheartened, if it does not happen quickly. I will eventually get there, I just have a lot of music and followers to follow up each and every day. I will also say though as I have said before that if your social media page, be it Facebook, Twitter, etc does not make it clear what you're about, then I will err on the side of caution and not follow that link. 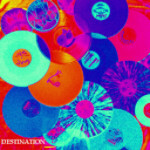 October 7th sees the worldwide online release of Vinyl Remixes by Destination as a download. This album is a 7 track download in all usual online music stores, featuring 7 different remixes of their song Vinyl released earlier this year on our label. The remixes are all very varied in style & sound, all sounding very different to each other. This Synth-wave & Synth-pop album features remixes from Sinestar, Markymix, Mind Veneration, Patrik Kambo, m00ger!, Glenn Dyson & Destination themselves. This LP is the result of a successfully funded Kickstarter campaign this summer & the band & label are very excited about its' release. Destination are Bridget Gray (vocals) & Glynn Jaine (synths) who live in Scotland, UK. Their dreamy brand of Synth-pop is perfectly crafted by Glynn with Bridget's sweet but powerful voice gliding over the top, creating wonderful melodies. Inspired by Erasure, Depeche Mode, etc, Bridget & Glynn make wonderfully enjoyable & beautiful music. You can find all of these brilliant tracks and many more on my Skerat's Eclectic Playlist, a perfect blend of great classic tracks, in combination with totally new tracks from my shows. 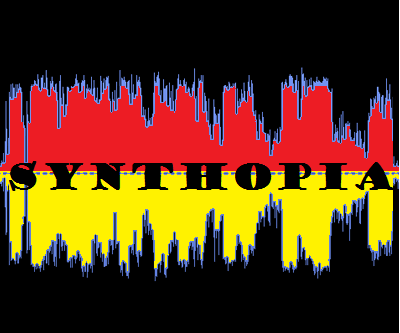 and remember this months show of Skerat's Eclectic Podcasts can be found here and while you're there maybe even check out some of the older Synthopia shows :) Well that's it for this week, thank you all for your continued and excellent support and until next weekend this is Skerat over and out. I look forward to reading your blog. We follow each other and similar sites. I particularly enjoy Revival Synth. I'm not sure how I follow your blog? Though manage to read it most weeks. Jamie Jamal. Thank you Andy, the revival Synth site is one of legend and is certainly one I highly recommend.